Save the Date! 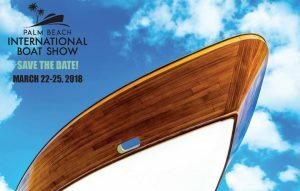 The Palm Beach Boat Show March 22-25, 2018! : Atlantic Yacht & Ship, Inc.
Save the date! The Palm Beach International Boat Show is only a few weeks away. As one of the top five boat shows in the country, Palm Beach International Boat Show marks it 33rd year, March 22-25, 2018. The show includes hundreds of boats from 8 foot inflatables, power boats, fishing boats, center consoles, bow riders, personal watercraft to super yachts over 150’. Tents full of the latest electronics and accessories, seminars and kids fishing clinics will be set up. There will be exotic cars, live music and fun for all. The Palm Beach International Boat Show features more than $1.2 billion worth of products. General admission for adults is $22, children ages 6-15 are $12 and children under 6 are free. Tickets can be purchased on the Palm Beach International Boat Show website. The show is located at 101 S Flagler Dr, West Palm Beach Fl 33401. There are 4 show entrances. The first two are located North at Evernia Street and Flagler Drive. The second two are located South at North Clematis Street and Flagler Drive. Atlantic Yacht & Ship, Inc. will be located on Ramp 2 and have a total of 12 boats on display: 100′ Broward 2001, 96′ Hargrave 2008, 90′ Hargrave 2001, 80′ Pearl 2018, 66′ Viking 2013, 60′ Classic Matthews 1970, 58′ Donzi 2003, 58′ Donzi 2005, 44′ Riva 2004, 44′ Zeelander 2013, 42 Canados Gladiator 2018, 35 Henriques 2007. For more show information, visit our Events Calendar.